This spacious, upscale 4,600 square ft. home has an anti-aging spa, 2 guest suites, dramatic views of Cathedral Rock both inside and out; and is complemented by rock-lined walking paths, outdoor benches, and a crystal garden on almost 2 acres. 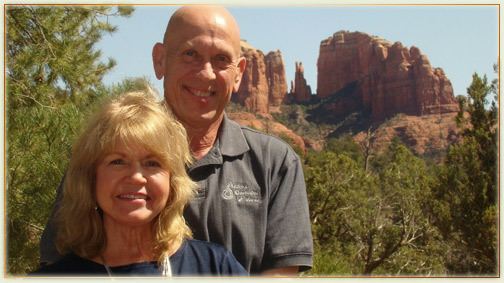 Listen to a short interview with Kathy and a local internet radio show host talking about Sedona. 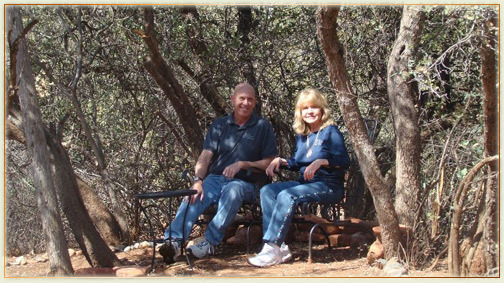 SEDONA, AZ (March 27, 2009) – Although there aren’t really any bad views in Sedona, I must confess that as I made my way along Red Rock Loop Road towards the Sedona Cathedral Hideaway Bed & Breakfast at 30 Serendipity Trail, I was cautiously optimistic about what I might find. Many B&Bs claim “dramatic” views of this red rock or that, but some times it requires leaning out of an upstairs window with binoculars and craning your neck to get the view. There’s also always a concern that years of guests coming and going has taken its toll on a place and its owners. Will a B&B measure up to the hype? Being located off Upper Red Rock Loop Road is a good start. This road has some of the most majestic and expansive views of Sedona, is right by the Red Rock State Park, and is just a skip and a jump from one of Sedona’s most photographed locations, Red Rock Crossing, by my favorite red rock formation, Cathedral Rock. I had also had an opportunity to interview co-owner Kathy Jaeckel for our local radio show, so I had gotten a glimpse into the Midwestern charm and service I thought I might receive. On top of that their B&B has just been named “#1 Romantic Destination for Two, Worldwide” by Trip Advisor. As Cathedral Rock came closer into view, I turned onto Serendipity Trail where the B&B is located. Kathy Jaeckel says that she and husband Larry named it that because they have been blessed with serendipitous good fortune. As I turned into the Belgian block lined driveway and gazed up at their beautiful Southwestern style B&B with Cathedral Rock about as close as you can get without sleeping between its spires, some of that blessed serendipity rubbed off on me. “This is the real deal,” I mumbled. 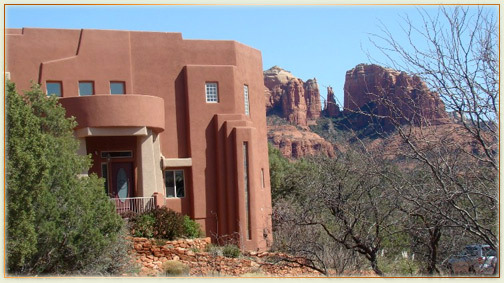 Sedona Cathedral Hideaway isn’t a typical B&B. This is an upscale home lovingly cared for by its owners with rock-lined walking paths, a heart shaped crystal garden, and sculptures dotting the landscape. And it’s a short hike to Red Rock Crossing. Inside the two story 4,600 sq. ft. home with two guests suites, an anti-aging spa, and high ceilings; artwork, tilework, and big windows abound. I was warmly greeted by Kathy and Larry, and besides being extremely friendly and welcoming, the one thing I noticed is that they were always holding hands. As a guest, it’s nice when the owners genuinely like each other. 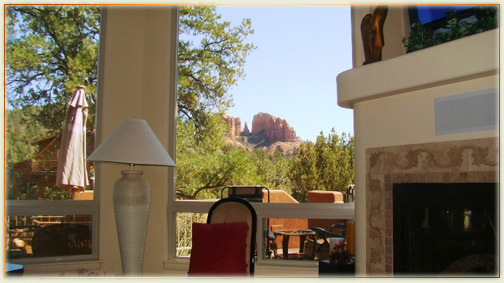 The Sedona Cathedral Hideaway B&B truly is a secluded, romantic gem, nestled among the red rocks of Sedona.